Founded in 1999 by some of the most accomplished risk professionals in the industry, Protecht delivers training, advisory, and software solutions that intensify the risk management focus and discipline of corporations and government departments alike. Their services are ideal for any organization that needs to not only build and streamline a practical risk management framework that encompasses risk mitigation and compliance, but also address the risk management expectations of both upper management and external regulatory agencies. Protecht.ERM accommodates an organization's existing risk assessment methodology and enables them to link back to their central risk event and control libraries. It allows risks to be assessed across multiple departments within the organization and aggregated through reporting. Protecht.ERM features a risk management and compliance database system which has been integrated seamlessly with InetSoft's Style Intelligence, all accessed through an easy to use online customer portal. InetSoft's user and role based permission system enables Protecht.ERM to provide individual users with a unique view when they log in to the Protecht website. The user sees only the type of information that's relevant to their job role, such as compliance obligations, what their key risk indicators or KPIs are, how many actions they have outstanding, or anything else related to their risk management duties. Style Intelligence is integrated seamlessly with Protecht's risk management database, providing dashboarding and data manipulation functionality while being completely invisible to Protecht's customers. Users input risk management data into entry forms (which they may create themselves) and any of the data inputted may be incorporated into InetSoft powered dashboards and paginated reports. These dashboards contain hyperlinks going back to the form entry system, so that case statuses may be modified after observing analytics. Protecht.ERM comes with a suite of pre-built dashboards and paginated reports powered by InetSoft's application that are designed to cover common risk management needs. 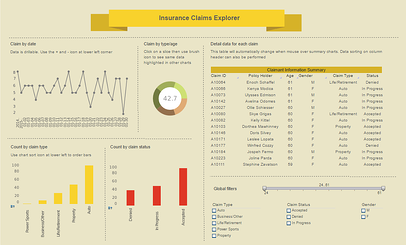 These dashboards are used for risk analytics, and each is linked to a properly formatted report, ready to be sent to regulatory agencies or the board of directors. InetSoft's robust self-service functionality allows Protecht.ERM users the freedom to alter these dashboards and reports to their needs, or even build fresh ones from scratch. This level of self-service extends even beyond the dashboard or report level. 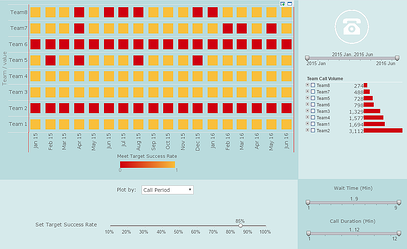 End-users can use the InetSoft data worksheet to do their own data mashups and add conditions and calculations to risk management data as it's coming into the dashboard or report. These are functions that would normally require an in-depth knowledge of SQL to perform. "The beauty of this is that even users who are not tech savvy can learn what data tables they want to use and drag them onto a data worksheet," exclaims April Pethybridge, Information Architect at Protecht. "When we demo the product, we can tell how excited our users are to no longer have to go through IT for dashboard or data modifications." "InetSoft is leading the way on self-service data manipulation," expresses Mark Flaherty, Chief Marketing Officer at InetSoft. "As our partner Protecht's end-user experiences attest, with a few clicks of a mouse, live data can easily be transformed, massaged, and mashed up saving so much IT or specialist time and resources that alternative, inflexibile data management and BI technologies still require. We like to say we are empowering citizen developers in today's information-driven business world." InetSoft's Style Intelligence is a data intelligence platform. At its foundation is a powerful data mashup engine that enables fast and flexible transformation of data from disparate sources, which can either supplement or obviate a data warehouse solution. At the development level, a unified interface allows for easy and advanced data manipulation and design of interactive dashboards, visual analyses, and published reporting. At the consumption level, self-service is maximized for a range of users, from casual business or consumer-type browsers, to power users and data scientists. As a cloud-ready, fully scalable enterprise-grade platform with granular security, multi-tenancy support, and multiple integration points, it serves both enterprises and solution providers. In either environment, ease of deployment and ease of use are chief development principles that help lower the time investment and total cost of ownership - and make the solution attractive to organizations of any size, with or without BI expertise. To learn more about InetSoft's Style Intelligence, view a demo, read customer reviews, and download a free evaluation copy, please visit https://www.inetsoft.com/evaluate. This Press Release was originally published on https://www.inetsoft.com/company/pressr/risk_management_platform_integrates_analytics_and_reporting.jsp.